40,000 years ago, humans had already developed the need to protect their feet from the elements. It took centuries, however, until the tasteful shoes of today were developed. 19th of September, 1991 was an important date for shoe history. On this day, a mummy was found in a glacier in the Ötztal Alps. Researchers also discovered a pair of well-preserved primitive shoes on so-called Ötzi's feet. The shoe uppers were made of deerskin, the insides of the shoes were made of woven linden bast, the cushioning and isolating layers were made of grass fibres, and the soles were made of bearskin. The footwear was estimated to be roughly 5,300 years old. This discovery, combined with research conducted upon 40,000-year-old Chinese skeletons as well as paintings found in the Altamira Cave dating back to 15,000 - 12,000 B.C., demonstrates that humans developed the need to protect their feet from the elements quite early on. That being said, shoe history cannot be traced back to a single, original shoe. Different climactic regions required different kinds of footwear, from animal furs wrapped around the feet and calves to palm leaves bound beneath the foot. These kinds of early shoes offered protection from the cold and heat, respectively. In cold regions inventions like these were the predecessors of boots, whereas in hot regions they served as the prototypes for sandals. As such, shoe development was strongly influenced by respective conditions. Mass migration from the (3rd to the 6th centuries) and the Crusades (of the 11th through 15th centuries) enabled the combination of different footwear fashions, which had until that time remained disparate. 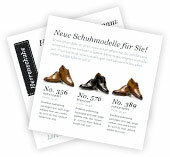 Bis daraus die heutigen bekannten types of men's shoes known today emerged. Much of the footwear available today is clearly influenced by the footwear of the past; shoe history lives on. Shoemaking, shoe contruction and shoe prodution methods have hardly changed since the 19th century. The only aspect of shoe production that has drastically changed is tanning. That which humans sought to achieve in prehistoric times is taken for granted today. 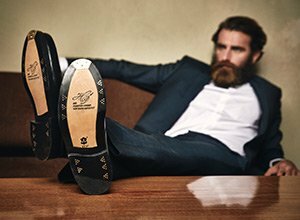 Modern men's shoes made of premium leather last a very long time when treated with the proper care. They also promise a perfect fit, which in turn helps wearers maintain healthy feet. Human beings already felt the need to protect their feet from the elements 40,000 years ago. The first shoes consisted of animal hides and furs wrapped around the foot. Classical antiquity marked the first peak phase of shoe development. Whether sandals or opanci, shoes served as identifying symbols of social rank. In hindsight the Middle Ages seem dark. Nevertheless, shoe production flourished during this period. Over these centuries, new types of shoes were introduced, heels were invented, and even Goodyear-welted shoes were developed. The 19th century served as a launching pad for the men's shoe fashions of today. We have this century to thank for much of what we now consider standard in terms of shoe design and production method. In the 20th century, synthetic materials conquered the shoe industry. Gluing replaced stitching and produced a glut of inexpensive discount shoes. The 20th century also saw the rise of new consumer demands.